Up until a few weeks ago, the Gentleman’s Game Hall of Fame was empty. Then Corey Seager homered three times and scored 42 points, and became the first honorary inductee. It’s a weird thing, because we just can’t allow Franklin Gutierrez into our Hall. It doesn’t feel right. He scored 43 points and was a huge reason t3bird04 pulled past DStars45 later on in the night last Friday. But Michael Saunders scored 52 friggin’ points! He homered three times and drove in eight. Of course, I was on the receiving end of it in my lone head to head league, too. And any league I have a shot in of course the guy I’m jockeying for position with also had Michael Saunders! Saunders will show up in my nightmares forever, driving in eight with that ‘3 3 8’ line in the box score. 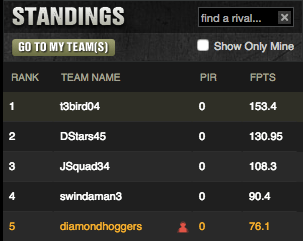 Only one gent had the medium-priced Saunders and that was the defending champ DStars45. 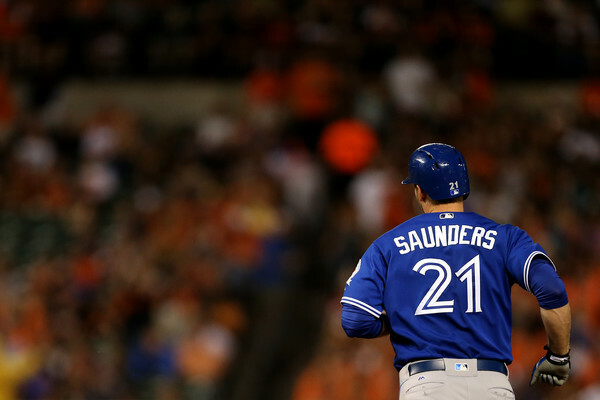 Saunders owes him because if he was not in play in this Gentleman’s game, no Hall of Fame for Saunders of course. Here are the weekly standings, with t3bird and Gutierrez pulling down five points. DStars45 is starting to stretch out a nice lead; and if JSquad34 doesn’t stop leap frogging me and then going underneath me! I am tired of needing to adjust these damn standings. Then again, maybe I should stop either finishing first or last every week. It’s now time for the Fantasy Players to Bludgeon. First we’ll do the weekly winners, followed by our yearly turdballs. Mike Trout (so useless on Friday’s please look it up beginning 2015 he never does anything on a Friday evening). I know I’m missing some folks but close enough for the girls I go with. Now here’s a copy of the winning lineup that t3bird04 strung together. Added bonus points for fielding this lineup from his brother’s wedding, and congrats to t3bird brother on embarking on the great journey of marriage. Hopefully you bring your wife each Friday night like your brother, a true gentleman and family man of DFS should you ever venture into a Gentleman’s Game Cocktail party. SO…. what’s going to happen next week in the Gentleman’s Game presented by The Mean Bean of Powell Coffee Shop and Gold Bond Powder? We are quickly approaching the ‘Gentleman’s Game Live Final’ where it is possible all five gents are gathered in one family room to lose all their money in shocking fashion. Our night will be over by 7:20 PM and we will be left to make smores and watching JSquad34 drink his scotch and Swindaman3 make out with a cigar. We might get the beer bong out and see if we can down eight liters of Mountain Dew. We may have some special videos for you or some toilet picks prior to the festivities. The point is, if you’re a big fan of the Gentleman’s Game, you’ve got some big moments coming your way as the drama continues to build into a magnificent crescendo. 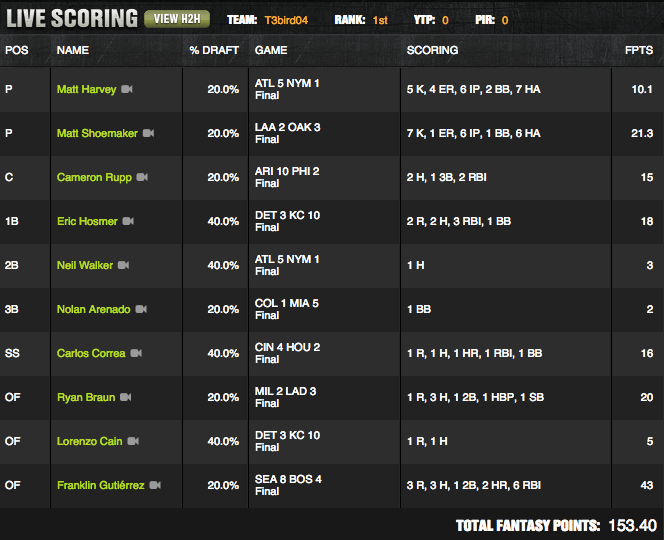 It’s not all doom and gloom in the world of DFS! Draftkings and FanDuel will soon merge to become a global superpower and be in cahoots with all the shady politicians in the world. You will be robbed of your referrals and they will roll out fancy incentives that are designed to stick it to the little guy. That said, I am going to come in around 2,000 of 115,000 tonight in a contest! This astonishing event which is as good as a small ant like me could ever do will yield me $10! With the winnings I will buy some Hostess cupcakes and a tin of chew, or maybe some new shoelaces. Definitely shoelaces. Stay tuned for the next twists and turns in the saga of the Gentleman’s Game. It is like Days of our Lives playing out in DFS form each week, where one gentleman’s life will change forever at season’s end.